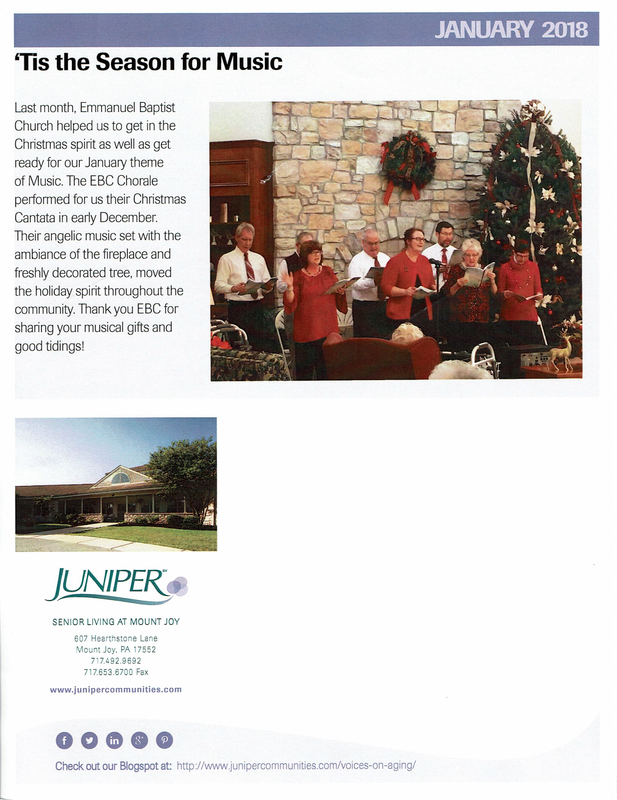 This past December, the Emmanuel Baptist Church Chorale's performed The Greatest Story Every Told: A Musical for Christmas for the residents and staff at Juniper Village in Mount Joy, Pennsylvania. The performance was warmly received and recorded in the January edition of the Juniper Village's newsletter, copy of article show below. Performers pictured include, front row left to right: Robin Rain (Choir Director), Cindy Edwards, Betty Scott, Lynne Donahue. Back row left to high: Doug Shifflett, David Edwards, David Myers, and Garret Rain.